Don't bother with Champagne, just crack a bottle of champers on the top table, then have the waiters bring out glasses of Cava, no one will notice the difference. Spend the money you save on something nice whilst on your Honeymoon! If you want champers spend a bit more and get tattinger from Morrisons for £20 a bottle. 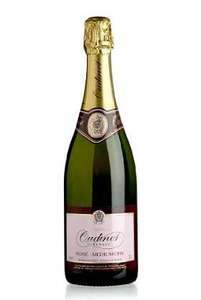 If you get cava get frexinet exellencia (brut or rose both very good esp the rose) 18 bottles delivered for about £77 quid from Morrisons using a code. I think the code is cata060. Hope this helps.